During this Olympic season, you may hear from announcers, critics, commentators and even athletes that the Olympic games are too commercial, too political, too "professional." Or that the judging is too nationalistic. In fact, politics, nationalism, commercialism and athletics were intimately related in the ancient Olympic Games. We may not realize it, but in today's games we recreatewith surprising accuracythe climate and circumstances surrounding the ancient Olympic Games. Photo: Scene from Attic Black Figure Amphora , ca. 510-490 BC, depicting a boxing contest ('pugme'). Two boxers wear soft leather 'himantes' or boxing gloves. The man with the long stick is either a judge or trainer. A naked youth stands by, holding extra 'himantes.' Museum Object Number: MS403. 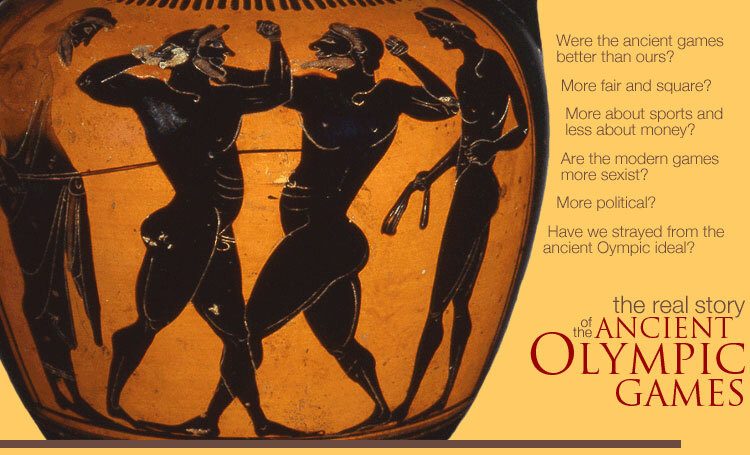 Don't miss ancient Olympic expert Dr. David Gilman Romano's web journal from the Athens 2004 Olympic Games! Dr. Romano is attending the Games with his family and is sharing his thoughts in an online journal, looking at the festivities through the lens of an anthropologist who has spent much of his career researching the ancient Olympics. Also, wondering who the greatest Olympic champions of all time are? Check out the list.